Happy Saturday! How about a sloppy joe? I wouldn’t normally put sloppy joes in the “exciting meal” category, but this recipe made an impact. They don’t have the typical sweet-smoky flavor – not that there’s anything wrong with a standard sloppy joe – but these were a nice change. I loved the addition of pinto beans and red bell pepper, both of which add a nice flavor and texture. My husband described this as having a “fresh, light” taste and he appreciated that it didn’t make the bun soggy. Speaking of buns, I went the extra mile and made King Arthur Flour’s Beautiful Burger Buns, which are oh-my-gosh so delicious. 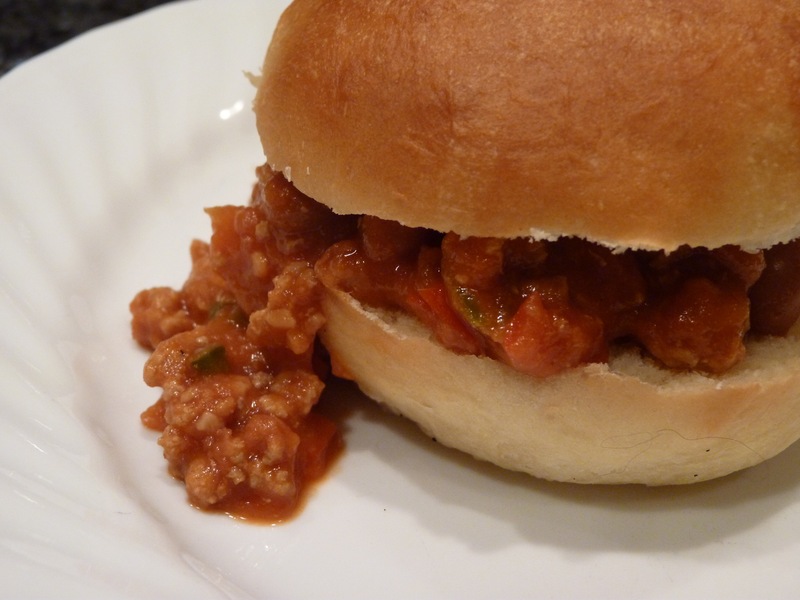 Homemade buns or not, give these sloppy joes a try! The recipe is on page 91 of The Food You Crave by Ellie Krieger. I’ve made lots of recipes from this book and have enjoyed all of them. You can also find it here on the Food Network’s website. I used ground turkey instead of ground beef. I didn’t want to deal with leftover tomato sauce, so I put in a whole can, which was a bit more than the 1 1/2 cups called for in the recipe. This looks delicious. I wouldn’t ever have thought to put beans in a sloppy joe. That sounds so delicious! And those burger buns are absolutely stunning! Nicely done, Jill! This sloppy joe looks delicious! I don’t like having leftover sauce either. I make sloppy joes with lentils and they turn out well. Yours look great and I love the buns.